Your Highway To Profits. Click To Get On It. '"; trends2tickers=" " + tickers2[numc] + "
Trend Score: " + tickers2Score[numc]+"
Intermediate Trend: " + tickers2Monthly[numc]+"
"Discover best emerging markets stocks with 12Stocks.com." Sort Emerging Markets stocks: Daily, Weekly, Year-to-Date, Market Cap & Trends. On this page, you will find the most comprehensive analysis of emerging markets stocks and ETFs - from latest trends to performances to charts - for investing & trading. Explore! April 24, 2019 - Although long term trend for Emerging Markets index looks good, the mid term and short term trends are faltering. The overall Smart Investing & Trading Score is 65 (0-bearish to 100-bullish) which puts Emerging Markets index in short term neutral to bullish trend. The Smart Investing & Trading Score from previous trading session is 58 and hence an improvement of trend. 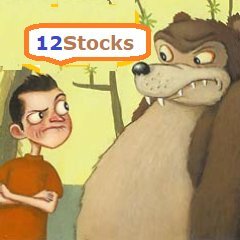 Consider signing up for our daily 12Stocks.com "Best Stocks Newsletter". You will never ever miss a big stock move again! Hot Emerging Markets Stocks of 2019 We try to spot trends by analyzing the performances of various stocks or components within Emerging Markets Index and try to find best performing stocks. The movers and shakers. The winners and losers. The following table helps investors and traders sort through current performance and trends (as measured by Smart Investing & Trading Score ) of various stocks in the Emerging Markets Index. Quick View: Move mouse or cursor over stock symbol (ticker) to view short-term technical chart and over stock name to view long term chart. Click on to add stock symbol to your watchlist and to view watchlist. Click on any ticker or stock name for detailed market intelligence report for that stock. The following table shows list of key exchange traded funds (ETF) that help investors play Emerging Markets stock market. For detailed view, check out our ETF Funds section of our website. Quick View: Move mouse or cursor over ETF symbol (ticker) to view short-term technical chart and over ETF name to view long term chart. Click on ticker or stock name for detailed view. Click on to add stock symbol to your watchlist and to view watchlist. We now take in-depth look at all Emerging Markets stocks including charts, multi-period performances and overall trends (as measured by Smart Investing & Trading Score ). One can sort Emerging Markets stocks (click link to choose) by Daily, Weekly and by Year-to-Date performances. Also, one can sort by size of the company or by market capitalization. Click on stock symbol or name for detailed view. Click on to add stock symbol to your watchlist and to view watchlist. Quick View: Move mouse or cursor over "Daily" to quickly view daily technical stock chart and over "Weekly" to view weekly technical stock chart. FMX Fomento Economico Mexicano, S.A.B. de C.V.
KOF Coca-Cola FEMSA, S.A.B. de C.V.
IBA Industrias Bachoco, S.A.B. de C.V.
PME Pingtan Marine Enterprise Ltd.
One More Thing ... Get Best Stocks Delivered Daily!